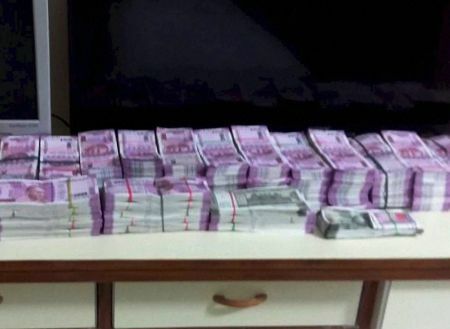 The Central Bureau of Investigation on Tuesday arrested an alleged hawala operator K V Virendra in connection with seizure of Rs 5.70 crore of new currency notes of Rs 2000 denomination from his premises in Karanataka. The agency sources said that the CBI has registered a case against officials of four banks -- State Bank of India, State Bank of Mysore, ICICI Bank and Kotak Mahindra Bank. They said Virendra was produced before special court in Bengaluru which has sent him to six days of CBI custody for questioning. The sources said during preliminary probe names of several persons have been taken by Virendra and it is trying to gather material evidence linking the alleged hawala operator with them. The sources said that during the six days of questioning the CBI will confront him with documents recovered from his premises and will try to get the source of these funds which may unravel alleged involvement of senior bank officials in the case.